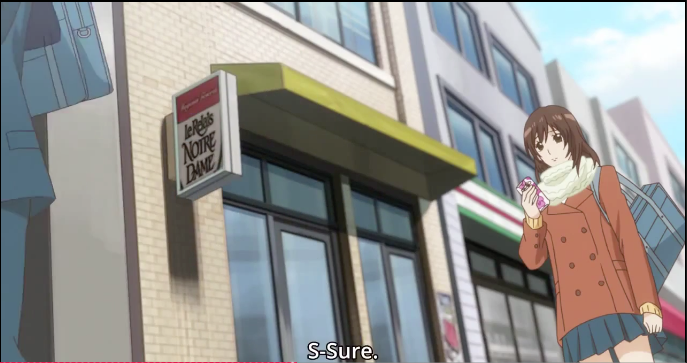 I was watching this crappy anime called Ookami Shoujo to Kuro Ouji, which means Wolf Girl and Black Prince and I saw in the background Le Rebels Notre Dame. It was really nothing but I have so many question. Like what is it supposed to be? Even my meager French skills knows it poor grammar which the irony of my own english grammar is not lost on me. But is it a play or a cafe or shop? Maybe it’s a reference? There is a High School in Missouri that is called Notre Dame Rebels but I doubt that is it. Once I figured out how to write it in Japanese I found mostly random pictures of motorcycles and Moomin stuff, which is pretty great. So I have no idea what this means but the fact that saw in the background is pretty good. And Really this anime was bad, don’t watch. in the second episode there’s a reference, when Rory gets “kidnapped” and is getting initiated into a group, there’s a reference…not sure which episode that one’s in though-I want to say it’s either in the 1st or second season. There’s also a reference when the town gets the church bells working again and Lorelie makes a reference…again, not sure which season/episode, but that one is later down the line. I was re-watching Gilmore Girls the other day and there are a lot of good NDDP/HOND references there. I will have to watch that show then.